Presented in October, 2004 at Buckhorn Springs Resort in Ashland, Oregon. This little gem of a conference was a unique opportunity to attend a smaller event with outstanding herbal teachers. Wide range of topics including the HPA Axis and endocrine health, herbs and diet for detoxification, natural alternatives to hormone replacement therepy, adrenal adaptogens, ovarian cysts, home remedies for women's health, principles of herb-drug interactions, the biphasic effect of herbs, thyroid deficiency and pain management. 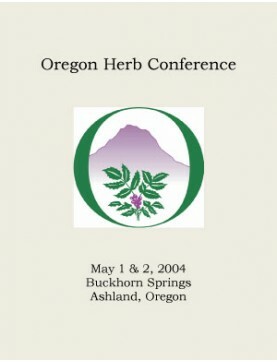 2004 Oregon Herb Conference: Conference Book. Order download of PDF file on this page. ..
Full Set of Oregon Herb Conference MP3 recordings includes these titles (each about 1.5 hours long; ..
Speaker: Howard Morningstar. The introduction to this lecture includes an examination of pathways of..
Panelists: Chanchal Cabrera, Jill Stansbury and Jonathan Treasure. This panel presents the prin..
Speaker: Deborah Frances. Adaptogens allow the body to maintain optimum functioning during stressful..